This post is the first of a series here, on CARA’s website, and CARA’s social media sites about a new landmark study of Catholic parish life in the United States, Catholic Parishes of the 21st Century (Oxford University Press, 2017). This volume brings together findings from multiple national projects that CARA researchers and Charles Zech have conducted in recent years to provide a 360 view of parish life today. 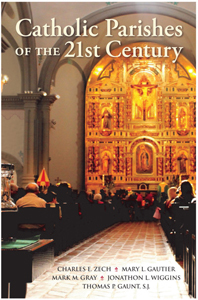 It is an intentional update to the groundbreaking Notre Dame Study of Catholic Parish Life in the 1980s. It is available for order now. Stay tuned as there will be much more to come from this volume here and elsewhere from CARA. Managing the typical Catholic parish’s finances in the United States is a difficult task. Many parishes are aging structures with significant maintenance and repair costs. Two out of three parishes in the country today were established before 1950 and more parishes have been closing each year than opening since the 1990s. The Church has been adjusting to a geographical realignment of the Catholic population for decades. Two-thirds of Catholics lived in the Northeast and Midwest as recently as 1985. Now, only 51 percent of Catholics live in these regions with growing numbers living in the South and West. In the Northeast and Midwest, pastors often have had to deal with declining numbers of parishioners and increasing costs for maintenance in older parishes. Parish finances are heavily dependent on the giving of parishioners. With fewer people in the pews, pastors must do more with less. Bishops have noticed the shifts in the Catholic population as well and also often need to deal with declining numbers of active diocesan priests available to serve as pastors. So many dioceses in the Northeast and Midwest have either used Canon 517.2, entrusting the pastoral care of a parish to a deacon or lay person, or have reorganized by closing, merging, and clustering parishes. One of the findings of Catholic Parishes of the 21st Century is that parishioners in a Canon 517.2 parish or in parishes affected by the creation of a new parish are more likely than those in the typical parish to give more to their weekly collections. 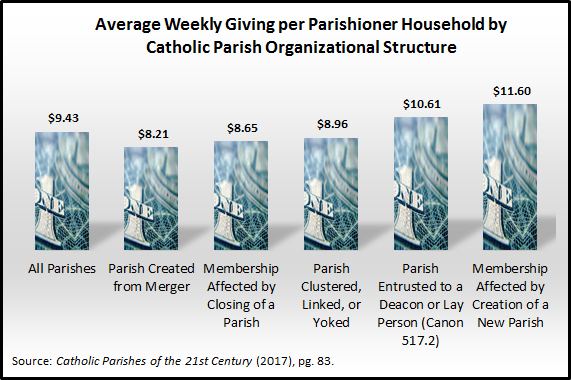 Parishioners give less than the parishioner in the typical parish when their community is the result of a merger, is affected by a nearby closure of a parish, or when their parish is placed in a cluster or other partnership with nearby parishes. The typical parishioner household in the United States gives just under $10 to the weekly collection at their parish. Imagine a small parish with the regular attendance of 500 family households and 100 single parishioners. Giving, $9.43, on average, this would result in a total weekly collection of $5,658. Multiply that by 52 weeks and the grand total comes to $294,216. Parishes have other sources of revenue but this would represent a significant chunk of the annual resources. Parish communities that are merged, affected by a nearby closure, or that have been clustered often get bigger as multiple communities are brought together in some form. Canon 517.2 parishes are typically small parishes where a priest is unavailable but there are no nearby parishes where a merger of cluster is feasible. A parish affected by the creation of a new parish may lose some of its parishioners to this new worship site or actually be this new community. Is giving by parishioners sensitive to the size of community? It appears so. Catholic Parishes of the 21st Century does show that giving in a parish with 300 households is higher than parishes with more than 1,500 households. In the smaller parishes the average given per week is $11.63 per household ($181,428 annual total). In the largest parishes the average given per week is $7.05 per household ($549,900 annual total). When parish reorganizations take place, the sizes of parishes change in a dioceses. These parishes should expect changes in the amounts given by parishioners, perhaps in response to perceptions of need, given the size of the community. Some may also seek to express dissatisfaction with changes and give less, while others may look to support their community more given the changes that take place. The case of the Canon 517.2 parish is interesting. In these communities, parishioners likely used to have a resident priest pastor. They may have struggled with Catholic population losses and eventually considered the possibility they might have their parish closed. The appointment of a deacon or lay person to provide the pastoral care of the parish (i.e., including arranging for priests to be available for Mass and sacraments) may be a blessing to them as they get to maintain their community. This may lead them to give more to support it.